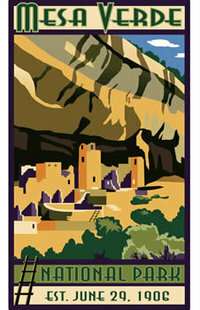 WPA style art of Balcony House from the Retro Ranger collection by Impact. 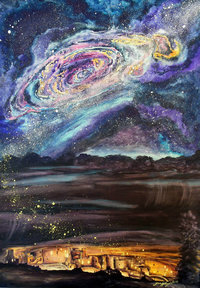 This beautiful giclee print is produced using archival matte finish paper and fade resistant inks of the highest quality. Its beauty is designed to last a lifetime. 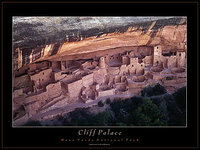 Artist — Ruth Osa, colorful Cliff Palace artowrk comissioned for Mesa Verde's 2006 Centennial celebration. The Colorado Plateau hosts the greatest and most diverse collection of National Parks and public lands on earth! Featuring over 50 National Parks, Monuments, recreation areas, and conservation areas, the Plateau is a wonderland for scenic and recreational opportunities throughout the year. 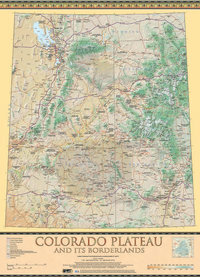 This version of the popular map is flat and printed on heavy stock, perfect for marking down your advetures across the Colorado Plateau. This popular oblique image offers a unique view of the Four Corners area of the American Southwest. Striking detail and geographic relief make this image a one-of-a-kind. Due to its obliqueness, this is not a true map as it is foreshortened therefore not to scale North to South. Parts of this image also appear to be three-dimensional, especially the Colorado River canyons. The La Plata Mountains are the backdrop to many views in Mesa Verde National Park. This poster features a stunning panoramic photo taken from Park Point and identifies all of the peaks. 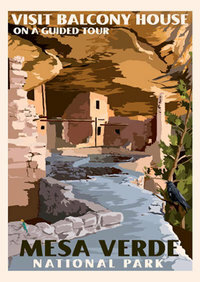 Southwest watercolor artist Jan Wright experienced first hand the magic of Luminaria Night at Mesa Verde National Park, when Spruce Tree House is illuminated by lanterns, paths are lined with candles, music abounds, and the park provides free chili and hot drinks. As the park's Artist in Residence in October of 2012, Jan's creative expression of the dwellings and sites intensified and often took on an other-worldly quality. "Mesa Verde Mugs, Authentic Pottery Replicas by Clint Swink" Double varnished and printed on heavy, acid-free, #1 premium stock for beauty and durability. 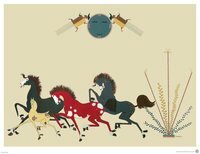 In 1937 Mesa Verde Museum Association purchased “Nevada Horses” from Navajo artist Gerald Nailor. 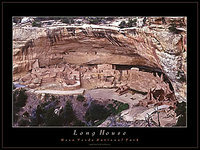 It was subsequently donated to the Mesa Verde National Park and currently hangs in the Chapin Mesa Archaeological Museum. Nailor was born in 1917 in Pinedale, New Mexico; his Navajo name is Toh Yah (Walking By the River). He enrolled in the Albuquerque Indian School from 1930 to 1934. After that he attended the Santa Fe Indian School, where he studied art under Dorothy Dunn from 1935 to 1937. His paintings are among the rarest of the Dorothy Dunn student's works because of his early death. In 1939, Nailor, Houser and Velino Shije Herrera were commissioned by the WPA to paint a large mural, which is still installed in the Main Interior Building in Washington, D.C. In 1942, Nailor was selected for a commission of a mural for the Navajo Nation Council Chamber in Window Rock, Arizona, to depict the history of the Navajo people. In 2004, the building (and its mural) was declared a National Historic Landmark. Dimensions: 20" x 26", printed on high quality, acid free paper. Artist info sheet included. Long before 16th-century Europeans began to explore North America, the land was already home to an estimated 30 million people who spoke diverse languages and complex cultures. 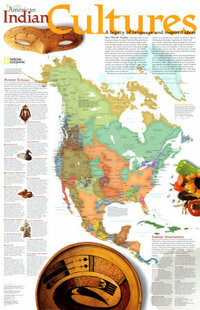 This legacy of language and inspired ideas is explored in this compelling North American Indian Cultures map. The map shows a broad sampling of linguistic families throughout the continent along with descriptions of each language group. A special inset highlights Native Americans innovations from parkas and snow goggles to new medicines and agricultural techniques. Coverage ranges from Central America to the farthest reaches of Canada and Alaska, as well as Greenland and the Caribbean Islands. 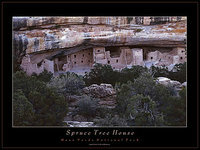 Photographer — Dennis Turville, Spruce Tree House in the morning. 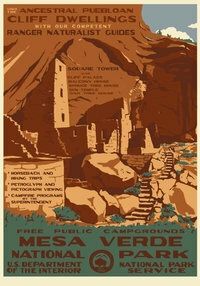 Artist — Doug Leen, serigraph print of a contemporary design featuring Square Tower House in the style of the Works Progress Administration (WPA).